World Market is a great retail destination for affordable global-style items, including home decor and furnishings. The retailer also offers unique gift finds. Use code HOLIDAY25 on 11/21 and 11/22 to get an extra 25% off sitewide. Use code CYBERSALE on 11/27 (Cyber Monday) for up to 40% off plus free shipping on purchases $50+. Use code SHIPJOY to receive free shipping on purchases $100+ on 11/23-12/24. Framebridge is a great online resource for all of your custom framing needs. Gift your loved ones with special framed photos! Take 20% off all black frames with code BLACK20. Offer is valid Friday, 11/24/17 through Monday, 11/27/17. Receive 20% off your first order of $175+ with code TWENTY175. Build.com is a great online resource for anything home improvement related. It is one of my "go to" stores for our own home renovation needs. These online lighting and decor merchants are offering deals up to 75% off. This is the perfect time to try handcrafted custom decor from Loom & Decor. 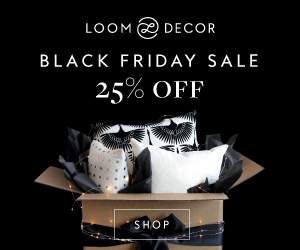 Custom window treatments, pillows, and decor are 25% off during the Black Friday sale (now through 11/30/2017). Use BLACKFRIDAY25 to receive 25% off sitewide. Have a sewing or upholstery project in mind? Fabric.com is offering some great doorbuster sales all week long.